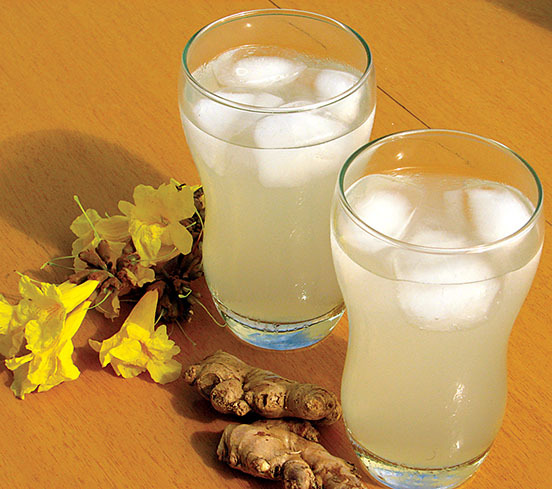 Wash the ginger root to remove any dirt or foreign matter, then cut the ginger root into tiny pieces. Put ginger in a blender one handful at a time until the blender is 3/4 ways full, each time. Add 1/2 cup of water to the ginger. Puree and allow ginger to process until grounded to a pulp. Remove pulp and place in a large mixing bowl. Add 1 cup water to pulp. Squeeze the pulp in your palm, allowing the juice to flow through the strainer. Put the squeezed pulp on a plate to the side. Repeat the process until all the pulp is squeezed. Add water to the squeezed pulp that you put on a plate earlier, in a mixing bowl. Mix all ingredients together. Your drink is ready. Note: Dilute with water if it is too harsh.